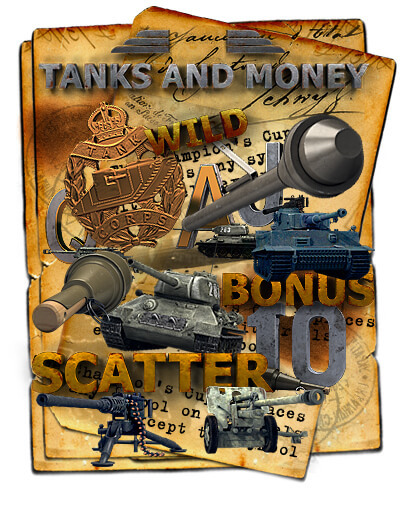 War symbols, battles, tanks at slot machine "Tank & Money"
Our new slot machine available for purchase in our shop – https://slotopaint.com/product/tanks-and-money/. 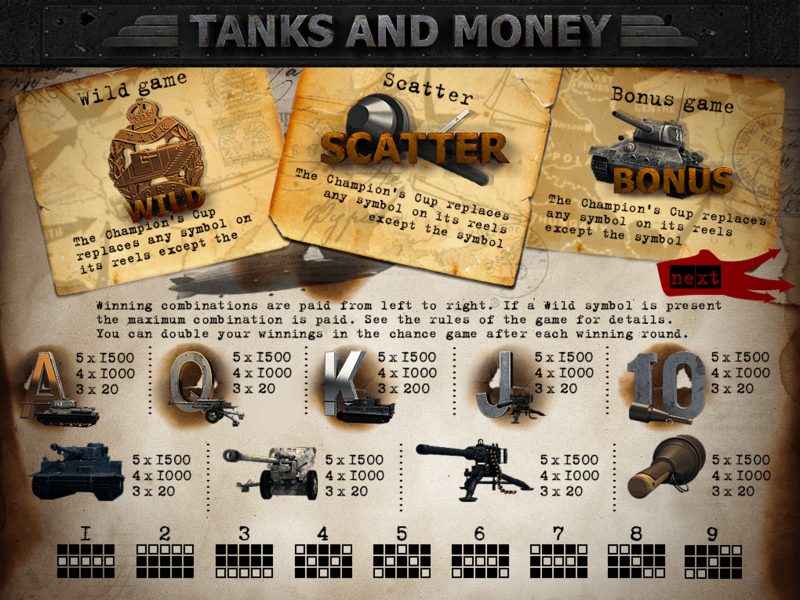 We present to your attention the main interface of the slot machine “Tanks & Money”. The action of this slot machine occurs in wartime between opposing forces. The game reels are a field of 5×3 cells, where all the game symbols involved in the game are conveniently located. Below is the control panel and navigation, where the player can not only to press the desired buttons, but also to track his game progress. For example, on the bottom panel there are special buttons for starting the game, autoplay, selecting the number of lines, and also for increasing or decreasing the bet. All your progress will be displayed in the windows located at the bottom left of the game interface. 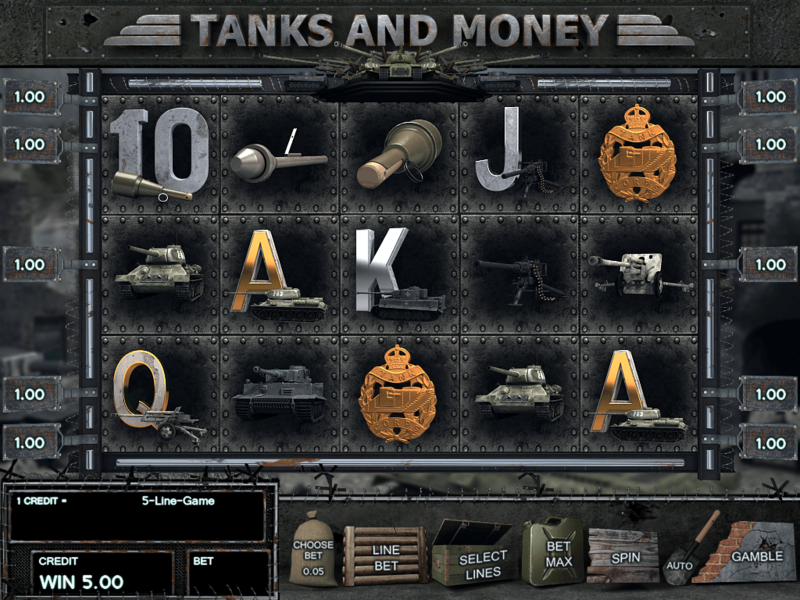 Here you can see a set of game symbols specially designed for the slot game machine “Tanks & Money”. 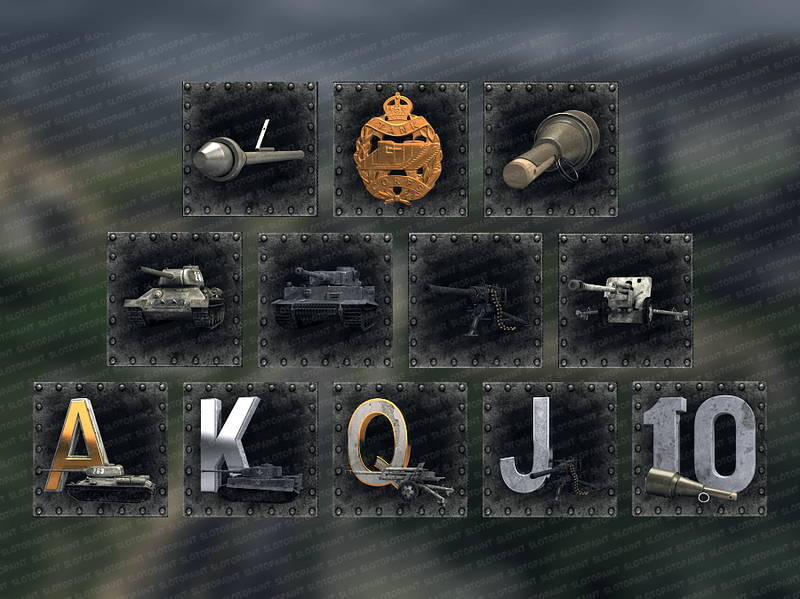 In this set there are symbols from different categories, including “low”, “middle” and “high”. Thus, the number of winning points may differ, as a result of simultaneously getting the symbols of one or another category. 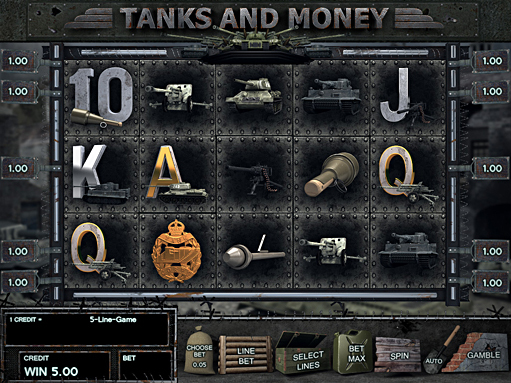 This screen is one of the bonus games included in the slot machine “Tanks & Money”. 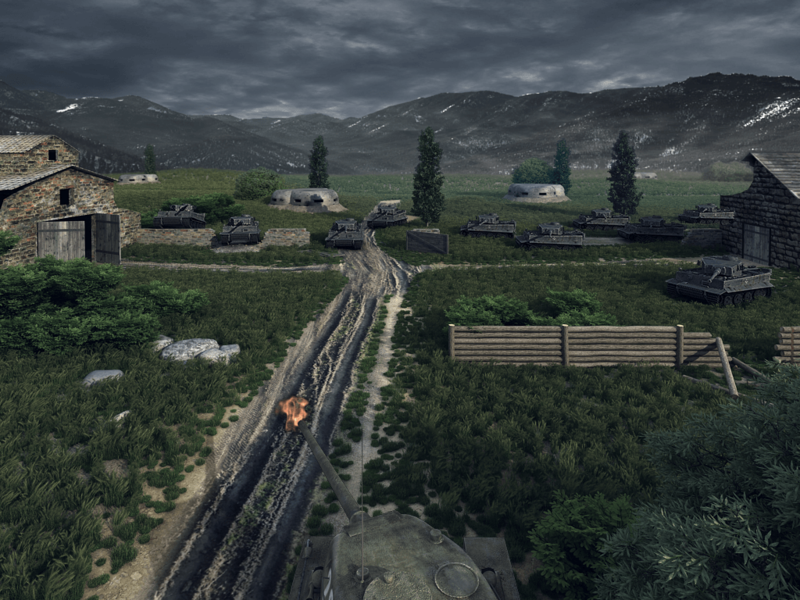 In a case of getting more than two bonus symbols, the opportunity to take part in the bonus game is activated, where you will have to hit the enemy’s equipment in the highlighted zones. Each successful hit brings the player bonus points. Here you can see an additional bonus game, where a whole division of enemy equipment was sent against you, and you have to smash them. 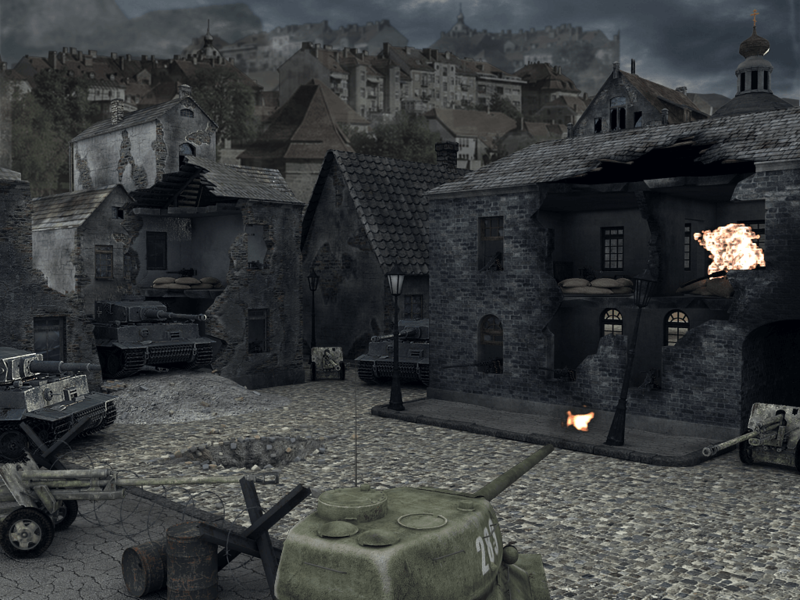 For each torn enemy tank you will be awarded bonus points. The game continues until you miss. 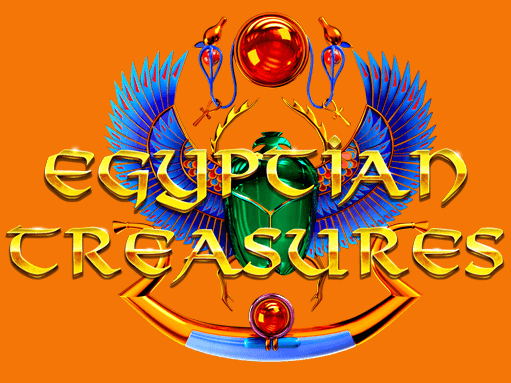 This screen is an auxiliary table of rules and payments, where the player can get acquainted with all the numerical values that are awarded for simultaneous getting of certain symbols. 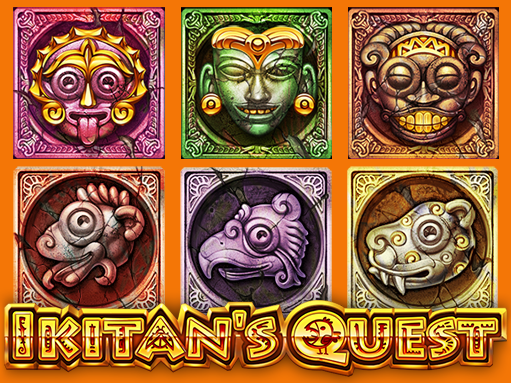 The more symbols of a certain type will be shown simultaneously on the game reels, the more winning points you’ll get. At the bottom of the screen there are combinations of winning lines.